My trainer left and now I’ve started riding with the woman who formerly owned the horse I’m leasing. She knows him incredibly well and I feel like we are finally on a really good track towards making some progress. In the last couple of weeks, Dunnie was starting to get really, really ornery. I wasn’t quite sure why; I speculated that it could have been the arrival of all the summer camp kids, or the ridiculous heat (upwards of 105 with the heat index). But I also noticed that he was becoming less sensitive to my cues and that things we had done pretty well before, like spins, seemed to be getting worse, not better. It was all a bit discouraging. It was a sort of in-betweeny time for me where I was missing lessons due to all the nasty weather we had and I was just trying to fix problems entirely on my own, and seemingly making them worse. But one lesson with my new trainer shed light on the problem. It wasn’t me; it was the equipment we were using. I have hated Dunnie’s saddle from Day One. It’s a nice-enough-looking show saddle, but it weighs like 3 tons. I can never lift it onto his back without giving myself a hernia and making him pissed off because I’ve got either the girth or the stirrup stuck underneath it. And apparently he has been hating it too. Wednesday night my trainer got on him during my lesson to see what was up with him; was he stiff, or just not used to being told what to do, or what? She turned around in the saddle and realized that the saddle looked to be too long and putting painful pressure on his back by his loins. We speculated that it could be the reason he kept pulling his head up much higher than he was supposed to be carrying it, and why he seemed to be charging around the ring like he wanted to do. She also pointed out that the bit he had on was quite harsh, and didn’t give me any leeway with connecting with his mouth without putting a lot of pressure there. I had some suspicions about the saddle. I’ve been reading Reining: The Guide for Training & Showing Winning Reining Horses by Al Dunning, and the chapter on the importance of fitting the saddle to your horse had some elements that jangled in my mind a little bit. But the equipment that I ride Dunnie in is his. It came along with him, so I kind of assumed that whoever picked it out for him chose stuff that fit him right. 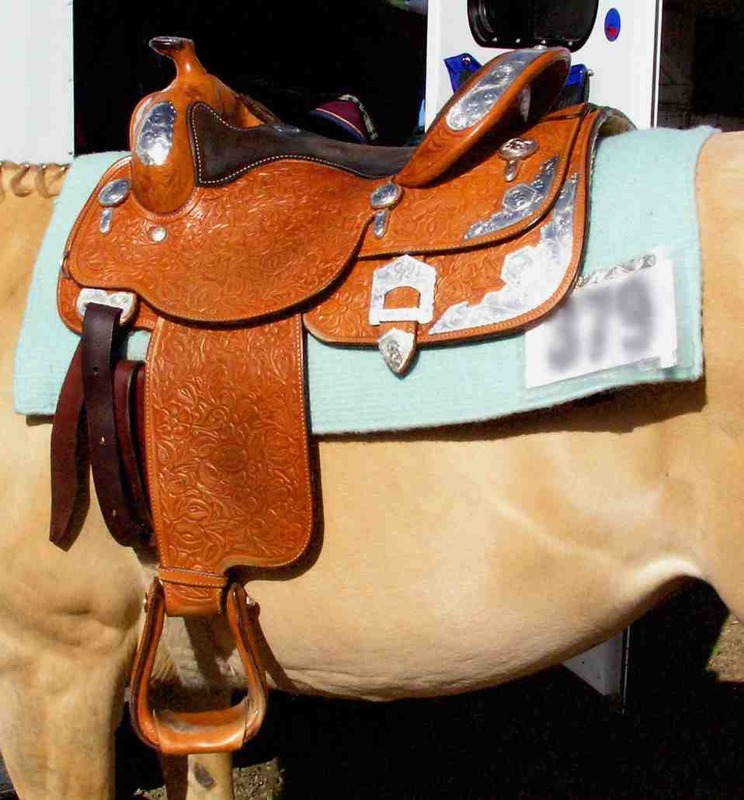 A heavy, Western show saddle. Yeah, that assumption was wrong. Last night I went out to the barn to ride again, this time with totally different tack. The saddle that my trainer picked out from the tackroom was seriously about 1/3 of the weight of Dunnie’s saddle, and the saddle pad had a nice split in it in the place where it goes over his withers, so it wasn’t putting pressure there. It was also a shorter length, so it didn’t cut into his back where the other one was. As a nice added bonus for me, the stirrups were a lot less stiff—the leather on his saddle makes it really hard to get the stirrups straight on my feet and I always felt like my ankles were being twisted. Now my feet are straight again and I can put a lot more weight into my heels. We also put him in a different bridle with a less-harsh shank bit, and (yay for me) no split reins. The difference was staggering. When I got on him last night, he was a different horse. My trainer said she could see him smiling—his ears were up, he wasn’t tense, he felt so much lighter in my hands. He wasn’t charging around the ring with his head in the air anymore, either. When we took off at a lope, I was able to make a slight connection with his mouth like I needed to rate his speed without him getting pissed. And he just naturally carried his head low and relaxed. Today I went out and rode him by myself in that same tack, and it was great. He was back to being that same willing, happy horse I started riding a couple of months ago—before the accumulation of pain from his tack turned him ornery. And now that he’s not so tense anymore, I can be a lot less tense. Before when we were cantering, he would pick up his head, which would cause me to tense on the reins, which would cause him to slow, which would cause me to tense in my calves to push him forward, which would cause him to speed up too much because I was gunning him, and then back to the tension on the hands again to try to slow him down. It was a feedback loop where we were really frustrating each other. Today, for the first time, we calmly loped a circle the way we’re supposed to. He was relaxed and responded to the slight pressure of my hands to regulate his speed, so I was able to stop my death grip on his sides with my calves, and really sit deeply in the saddle. If he felt like he was going to break, I was able to push with my seat to keep him going. Everything just felt so much more free and flowing. The whole thing has made me realize the deep importance of having the right equipment for your horse, and for that to be a serious part of the evaluation of what’s going wrong if there seems to be something going wrong. Keeping your horse as happy and comfortable as you can results in a better ride for both of you.